CSI needs a big data makeover — or at least the real-world version of forensics does. Iowa State University and several other partner institutions will become home to a new national forensic science center of excellence, funded by a five-year, potentially $20 million grant from the National Institute of Standards and Technology (NIST). The center will be led by Iowa State's Alicia Carriquiry, statistician and professor in liberal arts and sciences. Carnegie Mellon University in Pittsburgh, the University of California, Irvine and the University of Virginia will also provide researchers. 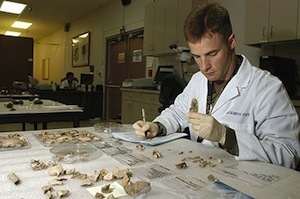 The center's work will focus on improving the statistical foundation under two branches of forensics: pattern evidence (fingerprint, firearm, toolmark, dental and other pattern evidence analyses) and digital evidence (including data from cell phones and computers). The center also will develop and implement an education program to train judges, lawyers and forensic science investigators to decipher results of statistical analyses on pattern and digital evidence. Scientists and researchers will develop tools to evaluate pattern and digital evidence analysis methods to determine the level of confidence forensic science users can have in their statistical modeling and measurement. Currently, DNA is the only form of forensics with "a strong, science-based statistical foundation for accuracy, reliability and data interpretation that supports its use as evidence in criminal court cases," NIST said in a statement. In 2009, a report from the National Research Council found "serious deficiencies in the nation's forensic science system." That report called for major reforms and new research, including a call to improve "the collection and analysis of forensic data; accuracy and error rates of forensic analyses." To address those problems, the report recommended establishment of a national forensics institute to lead research, establish standards and oversee education. The work at the new center is expected to complement current work being performed at NIST and the Department of Justice. "Forensic science plays a critical role in solving crimes, bringing perpetrators to justice and safeguarding the innocent from wrongful convictions," said Deputy Attorney General of the United States Sally Quillian Yates. "With its focus on pattern and digital evidence, the Forensic Science Center of Excellence will be an invaluable tool for defendants, prosecutors, judges and everyone involved in the criminal system." "Once NIST announced the terms of the competition, it became clear to us that assembling a strong team of statisticians with an interest in forensic sciences was exactly the right strategy," said Carriquiry. "We look forward to collaborating with NIST, with forensic and basic scientists and with practitioners in the United States and abroad, and to contribute to the fair administration of justice." Forensic science really is more complicated than the TV shows, she added. "Popular programs such as 'CSI' have contributed to the mistaken belief that identifying a single source for the evidence requires only that the scientist can establish a match between the evidence and the potential source."